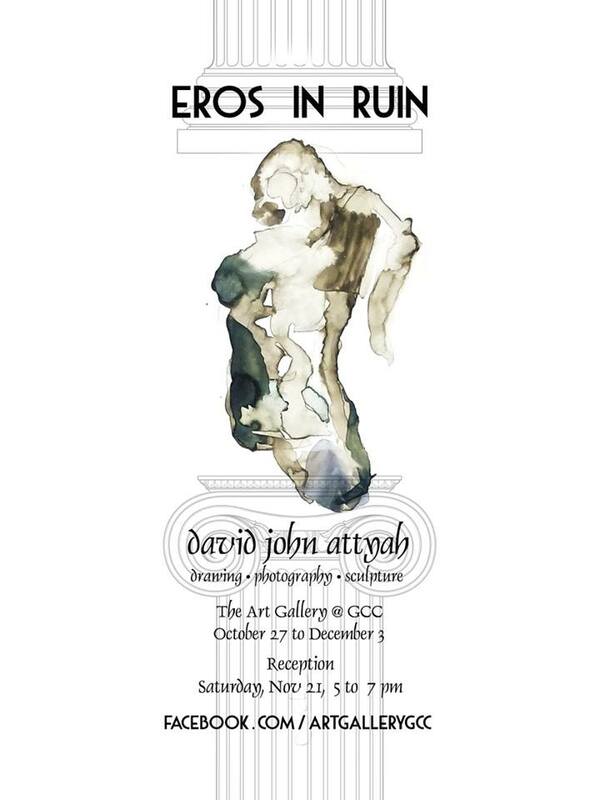 Eros in Ruin features works by Los Angeles-based artist David John Attyah. Inspired in part by the male hero, the exhibition reads like an exploration of the male psyche. Drawings appear alongside sculptural works and paintings alongside photographs, which collectively evoke a contemplative meditation on the psychology behind the male identity. Central to the show is ‘Zeus in Ruin’. From floor to ceiling, this full-scale installation includes a collection of automatic, unplanned drawings that delineate the male form in a variety of poses. Of particular note are a handful of figures whose frontal lobe region is marred with deliberate marks, smudges and scribbles that pulsate together in an eruption of fury. While the reference to Athena’s violent birth is inescapable here, the work as a whole speaks to the Classical hero’s tumultuous search for understanding and internal awareness. Another intriguing installation is Reliquary. The piece comprises 36 photographs depicting figurines that Attyah fabricated from an array of materials including plaster, wax, clay and paper. Emblematic of the more fragile constituents that comprise the male self, the sculpted pieces convey varying degrees of degradation. Like relics unearthed during an archeological dig, some are fractured while others have been broken into pieces. Reminiscent of the Greek Orthodox convention of the iconostas, ‘The Doors’ brings to mind the archetypal renderings of Christ and the Saints as they’ve appeared throughout art history. Unlike such depictions of the divine, Attyah’s figures instead project dark instances of human frailty. Painted onto marred hollow-core doors, fragmented male forms appear like shadows, disquieted by deep feelings of fear and longing. Attyah’s work has been exhibited internationally and published in select books and periodicals including Graphic Agitation (Phaidon: 2004), Art/Text and Ms. Magazine. In 2014, Attyah published The Jugular, a full volume work featuring 70 full-color pages in both hardbound and digital editions. 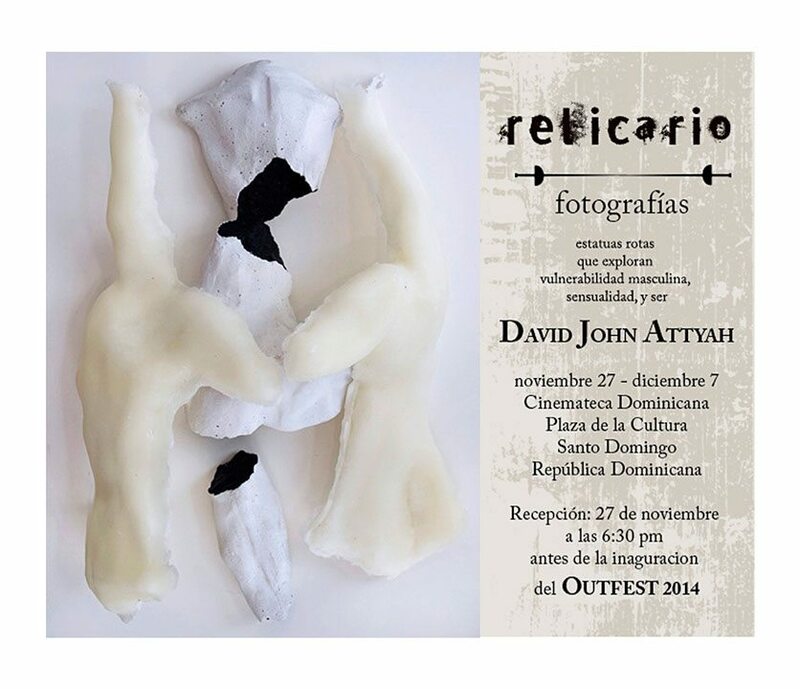 David John Attyah’s current movements and upcoming exhibitions can be followed at his Facebook page.